The haunted wood is a scary place full of creepy things that gives you a healthy amount of goosebumps. Light is provided only by a few candles that can be blown out all the time by ugly skulls that fly through this fantasy. 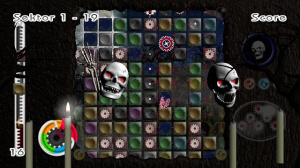 Try to have at least one candle burning all the time by shooting at them and keep the evil skulls away! 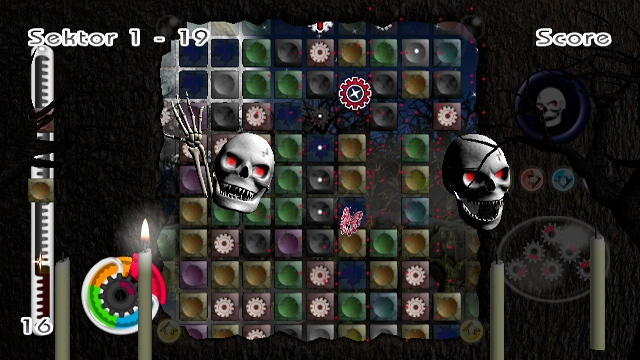 On the Plättchen Field, tombstones block your way to the Plättchen and can only be opened by shooting at them. Sometimes, undead bats live underneath and only wait for the right moment to come out and fly right into your face. Be careful: After a short while, the tomb stones fall over again and may crush your FantasyME with ease! Watch out for the bone hands crawling around, trying to grasp at your FantasyME and pull it down to the abyss. An ocean full of fruit juice, a bunch of delicous bouncing fruits and cute Plättchen – This is the Fruity Smile Fantasy. Shoot at the fruits that are bouncing and rolling around in this Fantasy and make fruit juice out of them. This fruit juice forms a big blob on your camera and blocks your view for a short time. When you hit a grape, it bursts and releases many small berries that jump around. 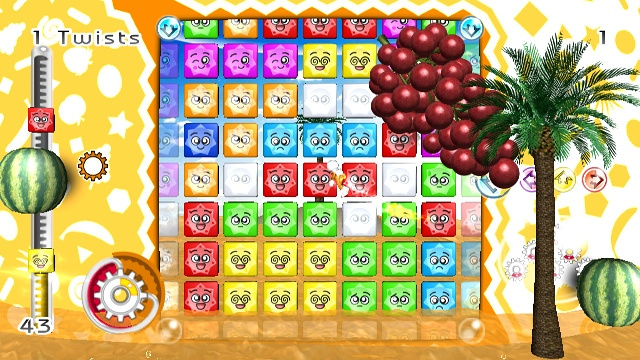 Protect your FantasyME from the wacky fruits and avoid getting hit! Each time the bar in your Energy Tube breaks an Energy Level, the Juice Ocean rises to a higher level. Most FantasyMEs can stay underwater just for a short time, so protect them from drowning! This beautiful and calm fantasy has no obstacles that can harm you. Seasons change with your Energy Level. In spring, delicate cherry blossoms greet the warm sunrays. Summer lets white angel’s feathers come down from the sky. Autumn is the time of colorful leaves that fall down from the trees. Winter covers the landscape in a coat of fluffy snowflakes. 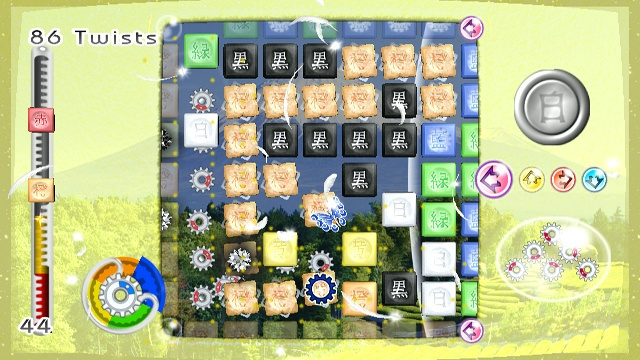 Enjoy the atmosphere, experience the harmony of Japan in all four seasons and focus your mind on solving the puzzles. Do let us know if all this sounds like your idea of a fantasy or a complete nightmare. Also if you want to know anything else about Plättchen, our resident Bplus spokesperson WiiBoy will be only too happy to answer all your questions in our comments area below. We don't want PLÄTTCHEN - twist 'n' paint to be a secret ... so let me know your questions. When will you show us a video of this game in action? It seems strange that we haven't seen anything yet. Same thing I've been thinking. Especially seeing as how this game is more expensive than the usual Wiiware puzzler, it seems like they should be releasing some footage to convince us that it's worth the money. I don't buy the whole, "You're getting a 15 dollar game when you normally pay 50." There are other games that could technically be sold for more, but the price was still kept lower. We hope to be able to provide you with a video soon! Right now it is at Nintendo and waits to be approved for distribution. I am really interested in this game, more so than the other WiiWare games. I have one main problem for it, it is not released yet. Bplus, any idea of when it may come out? For some reason this game reminds me of Boom Blox. Which is a very good thing. I don't mind paying 15 dollars, don't get me wrong. I just want to be sure it's worth it first. I'm glad to hear a video is coming soon though, that should help give an indication. We try everything to force Nintendo to release PLÄTTCHEN - twist 'n' paint in the US on Monday 22nd at the latest. You have to be kidding me, this game sounds awful!!! It just looks like some generic tile based puzzler. I think I'd rather get Groovin' Blocks when it hits Europe soon rather than this. You can get more Information about the gameplay, control and game modes of PLÄTTCHEN in the Interviews and on the game page here on WiiWareWorld! Will there be a german translation? And other Language translations here in Europe? This game looks gash man, WTF! What a lot of mixed opinions about this game! I do hope Plattchen comes out soon to settle the arguments once and for all. Hey its the Euro WiiWare update tonight isn't it? What would be the chances? Hey, we are just waiting for the approval of the video. Keep cool and keep curious. By the way, cool screenshots, the game just keeps looking better! Any news on the UK release date? Also, I THINK WE MIGHT GET STRONGBAD 2 TOMORROW! because if we dont, we have to wait more than a month, so I think it could be out over here tomorrow, and the US on monday. Hope a video can be released soon, I really want to see this game in action! Its got a lot to live up to, but its had plenty of dev time, so I wish it the best and hope its released soon to squash all the secrecy! Same here, I'm getting Groovin' Blocks because of the video then the review; actually, I really haven''t get how does the gameplay in PLÄTTCHEN - twist 'n' paint works. I agree. Wiiboy, please enlighten us. Aim on Plättchen and press A to change their color to the color highlighted on the Color Wheel. Spin the Color Wheel by tilting the Wii Remote. Four Plättchen of the same color in one row or column react with each other and burst after a few seconds. 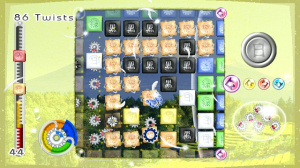 Connect additional Plättchen to the reaction and yield one energy unit for each exploding Plättchen. White Plättchen do not react with each other, black Plättchen cannot be twisted to other colors. To fill up your Energy Tube, destroy more than four Plättchen of a color at once as each color consumes four energy units in an explosion. To beat a level, fill up Energy Tube completely with as few twists as possible. The sequence of the incoming PLÄTTCHEN is static and repeating so you know exactly which colours are incoming next and if an item is coming next. You guys MUST know: Plattchen is my most anticipated WiiWare title right now. I'm super-excited for it and I can't wait!!!! Second is World of Goo. I can't wait until Nintendo finally releases it!!! There were statements to suggest it would release in July/August but now I'm more than ready to embrace Plattchen. I know people won't appreciate it as much as they should but I hope they give it a try. 1500 may seem daunting but it's truly worth it based on what I've seen and heard. I can't wait! I've been going on and on about it for quite some time. I can't wait for this to arrive. Being the puzzle fan that I am, this game is gonna be great! There's no doubt in my mind that I'm gettnig this on the day of its release. Whether reviews bash it or not. And I only have 1000 points plus. Oh well..."
I had a feeling I'd find this on Euro WiiWare tonight. Thankyou Wiiboy, it sounds more interesting than I though, and I understand the diferent fantasy/stages give a little change to the gameplay, right?, now I´ll wait for the video. If the game is good I don´t care the price but, how many memory blocks is gonna take? As it seems to be a very complete game. PLÄTTCHEN uses 287 BLOCKS and 2 more for the save file. Yes the FantasyWorlds change everything because you have to protect your own FantasyME (tries to follow the cursor). They have different abilities (speed and more) that is why you should choose the right FantasyME for each of the FantasyWorlds. I hope this game looks cool cause the screenshots are lookin nice too.. let us know how this game plays and works! Thanks for the info, sounds like an interesting puzzle title. I'll have to see the review before I purchase it, though. 1500 Wii points isn't something to be spent lightly. Did you guys have any idea it was coming out in the EU region today? Thanks again. I think you guys (Bplus) have work a lot in your game, so, good luck with the european market, I hope it gets top places. As the lucky europeans just got the game, that means soon we'll have a lot of videos and the site review , but I really have a good feeling about this game, its totaly on my DL list. You guys are so lucky. SO lucky. I can't wait for this to arrive!!! It's SO worth 1500 Points. It's SO worth 1500 Points.